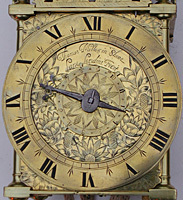 We have a large archive of sold clocks, and almost 150 articles by Brian Loomes on clock collecting, clockmakers and clock care and identification. For more information, please click the links on the right. Winners of the 2001 BACA award for excellence under the category of specialist clock dealers, judged on 1. quality of service, 2. consistent quality of stock, 3. depth of knowledge. Thomas Milles was a very fine clockmaker. He made lantern clocks and his work ranks alongside that of the best makers of his period. A spectacular two-handed hourly-striking, quarter-chiming and minute striking lantern clock is known by him, today in Leicester City Museum - and there are not many clockmakers you can say that about. His name is a little odd, in that he seems to have always spelled it as Milles on his clocks, though whether he pronounced it as Mills or as Millies we can never know. I am inclined to opt for Millies. Thomas Milles was made a Free Brother in the Clockmakers' Company in London in September of 1652. A Brother was someone who had served his apprenticeship through a clockmaker who was himself not a member of the Clockmakers' Company, which usually meant he had served outside London, but he might alternatively have trained under someone who was a member of another City Company. This means that Milles was not a full freeman and technically he was not allowed to produce and sell work under his own name, but could only work for some other workmaster. However this rule was hardly ever applied, and the fact that we do know clocks by him shows that he did actually work in his own right, though at just what period we cannot be sure. 1. A fine lantern clock with re-instated balance wheel escapement signed in a beautifully engraved hand 'Thomas Milles in Shoe Lane Londini Fecit'. Made in the 1650s. Click for closer view. 2. Close-up of the dial to show the exceptionally fine engraving and original hand. Click for closer view. It is hard to make much sense of the Clockmakers' Company rules, largely because they were broken almost as often as they were applied, especially if some senior member would benefit thereby. Thomas Milles had taken on three apprentices through the Company before he was even made a member of it, which makes a bit of a nonesense of things. In February 1646 he took on Henry Passion, in February 1650 Thomas Birch, and in March 1650 Matthew Crockford. He had bound these three apprentices 'through' Nicholas Coxeter, who was himself a full Freeman of the Company from 1647, having trained from 1638 to 1647 under John Pennock. Pennock himself has been a Brother since 1638, having trained in York, but we know for a fact he was working in London as early as 1630, a good eight years before he was obliged to join the Company. It was not uncommon for a member of the Company to act as an intermediary in binding an apprentice for someone who otherwise should not have one, as Coxeter did here for Thomas Milles. But idiotically Coxeter was himself not yet a Freeman (and was still officially an apprentice himself) when he bound Milles's first apprentice, and it was not until almost six years later (1652) that someone seems to have noticed that Milles was not in the Company at all! Commenting on the dates of apprenticeship all sounds very involved, but the point of it all is that those, who had the power to, bent the rules, and, reading between the lines, it was probably because Thomas Milles was working for Nicholas Coxeter all along. Each apprentice Milles took was bound 'through' Nicholas Coxeter. Maybe the Civil War had temporarily drawn their minds to more urgent business than that of the Company. Nicholas Coxeter himself was a captain in the war, and was thereafter referred to in company business as 'Captain Coxeter'. I imagine he was not a man to be argued with. At first Milles's unofficial apprentice taking went unnoticed, or perhaps, with his master swaggering about in armour, just unspoken. In 1651 Coxeter became an Assistant, the first level of seniority in the Company. In 1652 John Pennock became an Assistant, very belatedly in view of his much greater seniority, and in lieu of payment he gave the Company a 'house clock', or as we would call it today a lantern clock. Long before 1652 Milles should have been punished for taking apprentices when not approved, but a blind eye was turned. Perhaps we can assume that it was because he had behind him the heavyweights John Pennock, who had just donated a clock, and Captain Coxeter, with whom no man wanted to argue, that instead of being punished, Thomas Milles was allowed into the Company, even though as a mere Brother. 3. The movement from the right showing the finely cut and filed hammer spring and hammer counter. Click for closer view. Thomas Milles usually signed his clocks 'in Shoe Lane', but one is signed in 'Soe Lane'. Very few are known, about five or six in total, which is not surprising as he was working no more then ten years, and some of that time he may have been working for Nicholas Coxeter. We can probably assume he did not make clocks in his own name till after 1652. The last documentary recording of his presence is in 1662. Thomas Milles's apprentices included several, who themselves later became well-known makers of lantern clocks, amongst them Thomas Birch, Matthew Crockford, and William Glazier or Glassier. Glasier himself worked later in Shoe Lane and may have succeeded Thomas Milles in his business there. A very rare document survives in the form of a most interesting receipt dated August 1662 for work he did on a clock belonging to Lord Salisbury, a clock which appears to have been in appalling condition. By way of explanation the woch (= watch) part was the name for the going train, as opposed to the striking train, which is called the klok (clock) part. The varge is the verge. The fley is what we would today call the fly.